S Saraf, R Parihar. Sushruta: The first Plastic Surgeon in 600 B.C.. The Internet Journal of Plastic Surgery. 2006 Volume 4 Number 2. 1,2 in 600 B.C. 'Sushruta Samhita'(Sushruta's compendium) which is one of the oldest treatise dealing with surgery in the world indicates that he was probably the first surgeon to perform plastic surgical operations. This paper presents a historical window into various contributions of Sushruta to plastic surgery and allied fields which were described in 'Sushruta Samhita' more than 2500 years ago. 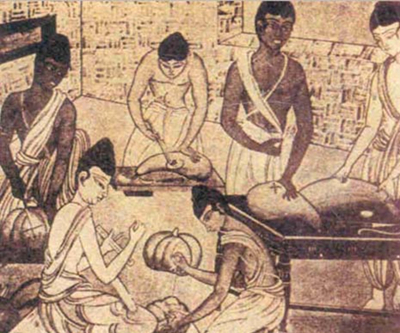 ‘Sushruta Samhita'(Sushruta's compendium), which describes the ancient tradition of surgery in Indian medicine is considered as one of the most brilliant gems in Indian medical literature. This treatise contains detailed descriptions of teachings and practice of the great ancient surgeon Sushruta (Figure-1) which has considerable surgical knowledge of relevance even today. The ‘Sushruta Samhita' contains the major surgical text of the Vedas and is considered to be the most advanced compilation of surgical practices of its time. ‘Sushruta Samhita' encomprises not only the teaching regarding the plastic surgery but contains composite teachings of the surgery and all the allied branches including midwifery and making it a comprehensive treatise on the entire medical discipline. 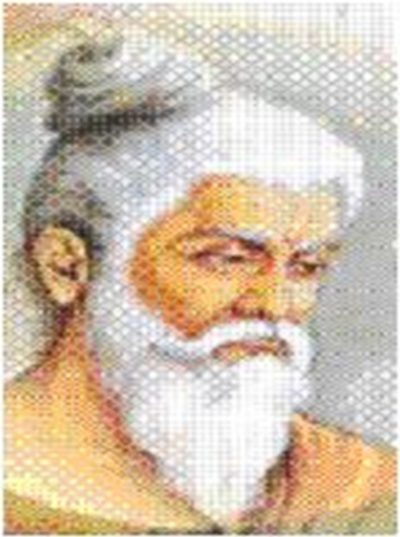 Sushruta believed that knowledge of both surgery and medicine are essential to constitute a good doctor who otherwise “is like a bird with only one wing.” In fact, Sushruta emphasized in his text that unless one possesses enough knowledge of relevant sister branches of learning, one cannot attain proficiency in one's own subject of study. According to Sushruta, “Any one, who wishes to acquire a thorough knowledge of anatomy, must prepare a dead body and carefully observe and examine all its parts”. The method of study was to submerge the body in water and allow it to decompose followed by examination of the decomposing body at intervals to study structures, layer by layer, as they got exposed following decomposition. The most important point to note here is that the dissection was performed without using knife. The treatise's insight, accuracy and detail of the surgical descriptions are most impressive. In the book's 184 chapters, 1,120 conditions are listed, including injuries and illnesses relating to ageing and mental illness. 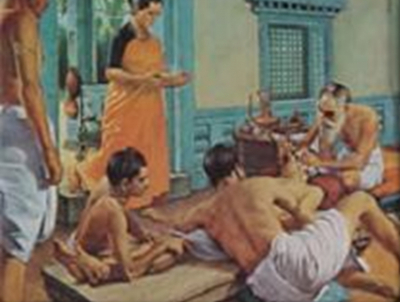 The compendium of Sushruta includes many chapters on the training and practice of surgeons. The Sushruta Samhita describes over 120 surgical instruments (Figure-3), 5,13 300 surgical procedures and classifies human surgery in 8 categories. One of the great highlight of Sushruta's surgery was the operation of Rhinoplasty. The making of a new nose captured the imagination of the medical world and brought him fame as the originator of plastic surgery.1 The famous Indian Rhinoplasty (reproduced in the October 1794 issue of the Gentleman's Magazine of London) is a modification of the ancient Rhinoplasty described by Sushruta in 600 B.C.15 (Figure-5). 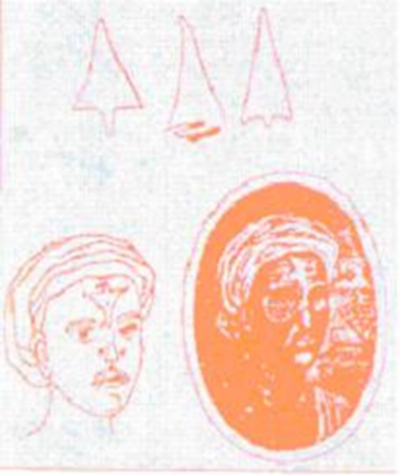 Even today pedicled forehead flap is referred to as the Indian flap. “The portion of the nose to be covered should be first measured with a leaf. Then a piece of skin of the required size should be dissected from the living skin of the cheek, and turned back to cover the nose, keeping a small pedicle attached to the cheek. The part of the nose to which the skin is to be attached should be made raw by cutting the nasal stump with a knife. The physician then should place the skin on the nose and stitch the two parts swiftly, keeping the skin properly elevated by inserting two tubes of eranda (the castor-oil plant) in the position of the nostrils, so that the new nose gets proper shape. The skin thus properly adjusted, it should then be sprinkled with a powder of liquorice, red sandal-wood and barberry plant. Finally, it should be covered with cotton, and clean sesame oil should be constantly applied. When the skin has united and granulated, if the nose is too short or too long, the middle of the flap should be divided and an endeavor made to enlarge or shorten it.” (SS. 1.16). Health, according to Sushruta is a state of physical and mental well-being brought about and preserved by the maintenance of humours, good nutrition, proper elimination of waste products and a pleasant harmony of the body and the mind. Sushruta says there can be nothing more magnificent than the act of treating human suffering, life giving, indeed is virtue and fame personified. He warns that improper intervention with surgical maneuver due either to ignorance of the progress of the disease-process, greed for money or lack of judgment, lead only to complications. Sushruta's general advice to physicians would certainly apply to doctors in any age and anywhere in the world: ‘‘A physician who has set out on this path should have witnessed operations. He must be licensed by the king. He should be clean and keep his nails and hair short. He should be cheerful, well-spoken and honest'‘. Cheek flap for reconstruction of absent ear lobe. Repair of accidental lip injuries and congenital cleft lip. Piercing children's ear lobe with a needle or awl. Use of suture materials of bark, tendon, hair and silk. Classification of burns into four degrees and explaining the effect of heat stroke, frostbite, and lightening injuries14. Fourteen types of bandaging capable of covering almost all the regions of the body and different methods of dressings with various medicaments. Use of wine to dull the pain of surgical incisions. 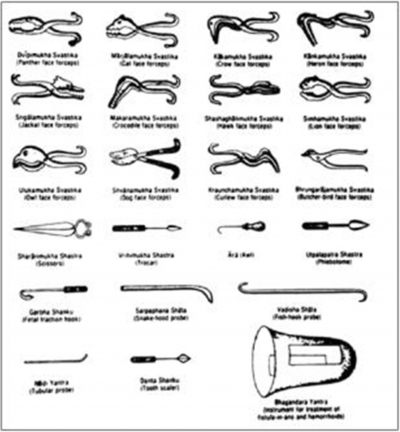 Described 20 varieties of sharp instruments *(sastra) and 101 types of blunt instruments (yantra) and their handling techniques. Advocated the practice of mock operations on inanimate objects such as watermelons, clay plots and reeds. Use of leeches to keep wounds free of blood clots. A code of ethics for teachers as well as students. Surgical demonstration of techniques of making incisions, probing, extraction of foreign bodies, alkali and thermal cauterization, tooth extraction, excisions, trocars for draining abscess draining hydrocele and ascitic fluid. Described removal of the prostate gland, urethral stricture dilatation, vesiculolithotomy, hernia surgery, caesarian section, management of haemorrhoids, fistulae, laparotomy and management of intestinal obstruction, perforated intestines, accidental perforation of the abdomen with protrusion of omentum. Classified details of the six types of dislocations, twelve varieties of fractures and classification of the bones and their reaction to the injuries. Principles of fracture management, viz., traction, manipulation, appositions and stabilization including some measures of rehabilitation and fitting of prosthetics. Classification of eye diseases (76) with signs, symptoms, prognosis, medical/surgical interventions and cataract surgery. Description of method of stitching the intestines by using ant-heads as stitching material. First to deal with embryology and sequential development of the structures of the fetus. Dissection and study of anatomy of human body. Introduction of wine to dull the pain of surgical incisions. Enumeration of 1120 illnesses and recommended diagnosis by inspection, palpation and auscultation. Sushruta took surgery in medieval India to admirable heights and that era was later regarded as The Golden Age of Surgery in ancient India .Because of his numerous seminal contributions to the science and art of surgery in India, he is regarded as the 'Father of Indian Surgery' and the 'Father of Indian Plastic Surgery'. Calcutta, 1907, Chapter 16, 152-154. 5. Das S. Urology in ancient India. Indian J Urol 2007;23:2-5. 9. Iram R. The Far East. In : Iram R, editor. Surgery. An illustrated history. Chattopadhyaya. New Delhi: Editorial Enterprises.116-140. 14. Agarwal DP. Susruta: The Great Surgeon of Yore. 17. Muley G Susruta: Great Scientists of ancient India. 18. Whipple AO. The story of wound healing and wound repair. Thomas C.
Williams and Wilkins Company: 1977:5-85.